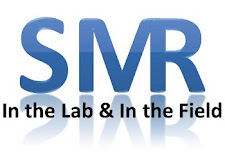 Take Home Message: A patient who is young or has a meniscal injury is more likely to have an anterior cruciate ligament surgery (either early or delayed). We have had quite a few posts on Sports Med Res surrounding anterior cruciate ligament (ACL) tears and the subsequent management of this injury (see a sample below). However, we still need to determine how to identify who may respond well to conservative treatment. Therefore, the authors aimed to define the rate of delayed ACL reconstructions and to identify predictors of early or delayed ACL reconstruction. The authors retrospectively assessed population-based medical records to identify all of the individuals in one county of the United States that had an ACL injury with no other concurrent ligament injury nor fracture between 1990 and 2010 (1841 patients). Using medical records, the authors found that 62% percent of patients had ACL surgery within 1 year of injury. 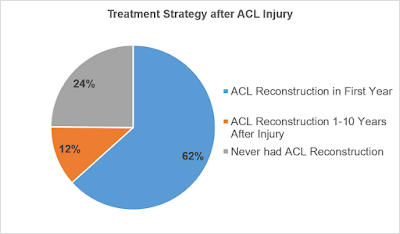 Only 32% of the 661 patients who were treated nonoperatively for the first year after their injury underwent an ACL reconstruction up to 10 years post injury (see Figure). Within this cohort, a patient who was younger or who had a meniscal injury was more likely to have an early or delayed ACL reconstruction. The findings of this study are interesting because these authors found that if participants could make it to 1 year after an ACL injury then only one-third opted for a later surgery. Oftentimes ACL reconstruction is sought relatively fast after injury. However, it may be worth making an attempt at conservative care and then making a decision regarding surgery by 1 year post-injury. Younger patients or patients who had a meniscal injury are more likely to undergo a surgery (either early or delayed). This may be a reason to consider counseling these types of patients about having earlier surgery. It would be interesting to see what level and type of activity these individuals are attempting to return to with conservative management. Longer term follow-ups or radiographic findings would be interesting in this cohort, to determine if a delayed surgery with a secondary meniscal injury has poorer long-term outcomes than a participant who opts for early surgery. The standard practice seems to be swaying, and is now a little less clear. It seems that initial conservative management may be a more viable and cost-effective option than it has been in the past 5-10 years and clinicians as well as athletes could consider it. Questions for Discussion: What do you take into consideration when thinking about ACL reconstruction for your patients? How do you typically manage ACL injuries in the clinical setting? Are you noticing any changes in your clinical practice?